So, managers, who’re worse: the folks in the other room or those who are spying on them? Who is right and who is wrong really doesn’t matter as long as whatever the inappropriate behaviour is addressed. Civility in the workplace is paramount to success. Bullying, poor morale, toxic environments and rudeness can all be improved, if not removed altogether. In the Baltimore Workplace Civility Study, 83% of respondents agreed that it was “very important” to their well-being, to their health, to their performance and to their job satisfaction to work in a civil environment. 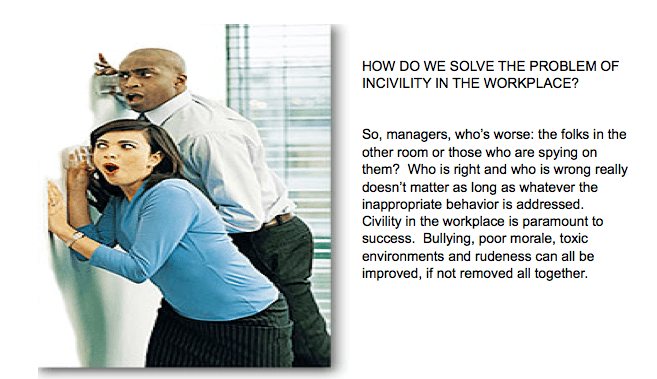 So, how do we solve the problem of incivility at work? Here is our answer: CIVILITY! To solve the incivility problem in our workplaces, we need to change how we work. We need to create workplaces that support a culture of learning where thinking is best practice. We need to build capacity for civil behaviour by giving people the skills they need to make better decisions and to contribute to reducing the stress and incivility in our workplaces. 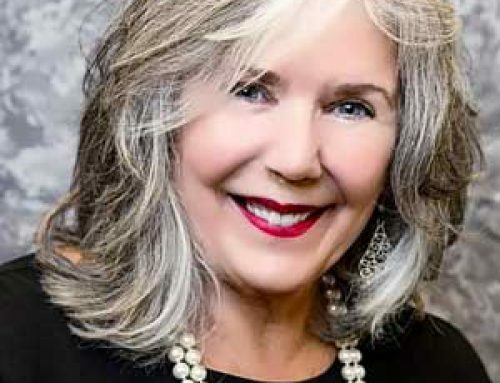 We need to embed civility in our workplace policies and procedures, into our organizational values and mission statements, into our job descriptions and codes of conduct, and into our hiring and evaluation practices. Civility has to become a core element in the character of our organizations. Stated directly, “Civility in the workplace is a change imperative for organizations expecting to survive, and thrive, in the new world of work”, this according to Lew Bayer, President, Civility Experts Worldwide. Ms. Bayer believes that civility at work is the solution for reducing desperation and building better workplaces. And the research suggests that she is not alone in coming to this conclusion. In The 30% Solution Bayer, echoes what many civility experts say and so offers organizations a proactive civility solution–a structured plan for changing their workplace culture. I maintain that organizations must plan, and then implement, this type of change. Or, in not doing so, they must expect to pay the high costs of incivility in their workplaces. Through proper assessment, defining civility, applying the Civility Culture Compass®, and along with training based on the Civility Competency Matrix®, I believe you can create change-ready, socially intelligent, systems-thinking, culturally competent, knowledgeable workers and as a result, better manage the causes of incivility and desperation in your workplaces. Employers need to care about a civil workplace. It is proven that they are more profitable and the employees are happier. Retention is more likely. Above all, it is the right thing to do. Click here to Get a 49-page Culture at Work Brief here and an answer to incivility in your workplace for free with our compliments.